Almost exactly one year ago, the Georgia Aquarium's request to import 18 wild-caught beluga whales into the U.S. was denied by the National Oceanic and Atmospheric Administration (NOAA). Now, the aquarium is headed back to court about the issue - but it will be met by a blockade of conservationists who plan to thwart the facility. The aquarium applied for the permit to import belugas - something that hasn't been done in over 20 years - back in 2012. After it was denied in August 2013, the facility filed suit, seeking a ruling in federal court to force the permit through. On Wednesday, representatives from the aquarium will appear at the U.S. District Court Northern District of Georgia in a bid to add more documents to their permit application, as well as to seek documents about NOAA's decision. The whales, which were caught between 2006 and 2011 in Russia's Sea of Okhotsk, are currently held at the country's Utrish Marine Mammal Research Station. If they were to be imported, the animals would be distributed to six different facilities, including all three SeaWorld parks and the Shedd Aquarium in Chicago. But the Georgia Aquarium won't be alone in court on Wednesday. Several non-governmental organizations have joined forces to intervene on the government's behalf. While the aquarium is challenging the decision handed down by NOAA, the organizations will be complementing the government's decision with additional and more relevant information. "Several NGOs, led by AWI [the Animal Welfare Institute], are intervenors in the case, on the side of the government," Naomi Rose, a marine mammal scientist with AWI, told The Dodo in an email. "We believe the government has a strong case and we support its decision." We determined that the requested import will likely result in the taking of marine mammals beyond those authorized by the permit. There are ongoing, legal marine mammal capture operations in Russia that are expected to continue, and we believe that issuance of this permit would contribute to the demand to capture belugas from this stock for the purpose of public display in the U.S. and worldwide, resulting in the future taking of additional belugas from this stock. Back in April, when word broke that conservationists would be able to intervene in the case, Mark J. Palmer, Associate Director of the International Marine Mammal Project of Earth Island Institute, told The Dodo that the company that captured these whales in the first place, Utrish Dolphinarium, Ltd., has a disturbing history of capturing other cetaceans, including wild orca whales. 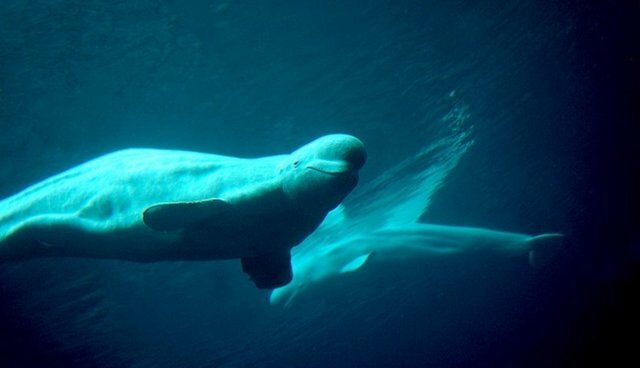 The US public display facilities involved with this import request claim that they are committed to the conservation of cetaceans, but in this case they chose to deal with Russian entities that have captured hundreds of wild beluga whales. Sadly, I believe that these facilities are likely to submit future requests to import additional wild-caught cetaceans, unless a clear message is sent that sourcing cetaceans from the wild does not contribute to their conservation.